This is the first time in 3 years that I have not been working in retail and I've realised that I am not yet in the festive mood. But now that we're in November I feel like I need to start getting prepared for Christmas, with present shopping and decorating the house! 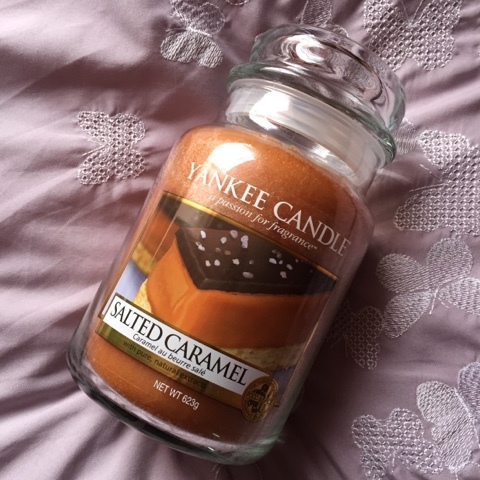 So to get me in the mood for the festive season I decided to start burning my favourite Yankee Candle in the scent Salted Caramel. I don't know why this smell reminds me so much of the holidays, but it definitely is a Autumn/Winter scent! This smells exactly like salted caramel tastes, you get that hint of sweetness from the caramel but there's an extra warmth in the smell that doesn't make it a typical sweet smelling candle - it's very hard to explain. I have a small jar as well as the large jar in the picture because it is so good. Like most Yankee candles, the smell is strong enough to make you smell it throughout the whole house! Keep an eye out for this candle in your local Clintons - that's where I get my Yankee Candles from! If not then you can order off the Official Yankee Candle website. I love salted caramel anything so this sounds amazing! !